I don’t know if people hear the same things we used to hear, more or less on a daily basis, that you’re a cog, a gear, or screw somewhere in the ultimate works of society. The days I’m recalling were well before they encouraged big aspirations in every kid. Essentially they helped you focus on your little place as a responsible nut or bolt in the overall works. I say I don’t know, but on reflection, it appears certain, at least on the surface, that a lot of that has gone by the wayside. In the post-WWII period it was one way, settling into your position, whether by social planning, a divine purpose, or just your natural responsiveness to the obvious underlying drive. The same thought went into the cookie cutter houses they came up with, in haste, in getting society back on a peacetime footing. Not to be too sociological, there seems to be a natural progression from the helter skelter scene of wartime to fitting into definite channels for peacetime. But they never actually said any of this. So if you’re a kid, you think they’re just against you personally. When it’s really only a macro sense of things and getting you situated in your little slot. And anyone who doesn’t fit precisely, now now now, is like a spare part to be cast aside. And I suppose, naturally, some of those drives went into giving us a generation of guidance counselors straight from the bowels of hell. There they were, fermenting in the bowels of hell -- like other bowels but smellier -- not even fully aware themselves of the infernal basis of their hellish drives, every bit the same cogs in an unforgiving machine that they expected us to be, working it point by point, sending you up the chute of happiness or driving you down down down like the worm you were. Or pond scum, which to me is nastier than worms. And we grew up afraid of pond scum, not knowing we shared certain sociological qualities with those denizens of the shallow. So here we have the guidance counselors of that day, assembling in rigid lines, themselves parts in the system, and being sent like demons to their bitter work, marking the quick and privileged for their destiny, then the rest of us to a dim purgatory of fruitless existence. Without even the mercy we might grant worms, the mercy we show when we poke air-holes in their little cup or container. 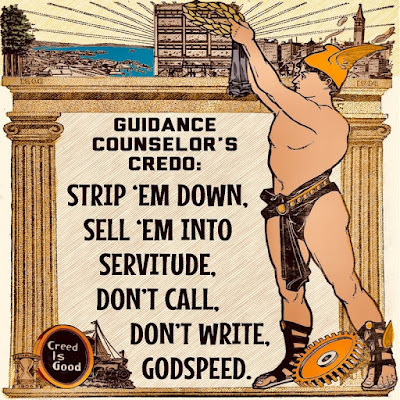 Is it too harsh to suggest that the Guidance Counselor Credo was “Strip ‘em down, sell them into servitude, etc.”? It’s right up there with Death Row, of course, with the 13 last steps to the gallows and a priest muttering words of comfort, more or less for himself, before they release the trapdoor. It’s a terrible credo, yes, but 100% accurate. And if the guidance counselor worked overtime, the percentage went up several additional points.